An elastic network interface (referred to as a network interface in this documentation) is a logical networking component in a VPC that represents a virtual network card. You can create and configure network interfaces in your account and attach them to instances in your VPC. Your account might also have requester-managed network interfaces, which are created and managed by AWS services to enable you to use other resources and services. You cannot manage these network interfaces yourself. For more information, see Requester-Managed Network Interfaces. All network interfaces have the eni-xxxxxxxx resource identifier. The term 'elastic network interface' is sometimes shortened to 'ENI'. This is not the same as the Elastic Network Adapter (ENA), which is a custom interface that optimizes network performance on some instance types. For more information, see Enhanced Networking on Windows. You can also modify the attributes of your network interface, including changing its security groups and managing its IP addresses. In a VPC, all subnets have a modifiable attribute that determines whether network interfaces created in that subnet (and therefore instances launched into that subnet) are assigned a public IPv4 address. For more information, see IP Addressing Behavior for Your Subnet in the Amazon VPC User Guide. The public IPv4 address is assigned from Amazon's pool of public IPv4 addresses. When you launch an instance, the IP address is assigned to the primary network interface (eth0) that's created. When you create a network interface, it inherits the public IPv4 addressing attribute from the subnet. If you later modify the public IPv4 addressing attribute of the subnet, the network interface keeps the setting that was in effect when it was created. If you launch an instance and specify an existing network interface for eth0, the public IPv4 addressing attribute is determined by the network interface. For more information, see Public IPv4 Addresses and External DNS Hostnames. You can associate an IPv6 CIDR block with your VPC and subnet, and assign one or more IPv6 addresses from the subnet range to a network interface. All subnets have a modifiable attribute that determines whether network interfaces created in that subnet (and therefore instances launched into that subnet) are automatically assigned an IPv6 address from the range of the subnet. For more information, see IP Addressing Behavior for Your Subnet in the Amazon VPC User Guide. When you launch an instance, the IPv6 address is assigned to the primary network interface (eth0) that's created. For more information, see IPv6 Addresses. You can enable a VPC flow log on your network interface to capture information about the IP traffic going to and from a network interface. After you've created a flow log, you can view and retrieve its data in Amazon CloudWatch Logs. For more information, see VPC Flow Logs in the Amazon VPC User Guide. The following table lists the maximum number of network interfaces per instance type, and the maximum number of private IPv4 addresses and IPv6 addresses per network interface. The limit for IPv6 addresses is separate from the limit for private IPv4 addresses per network interface. Not all instance types support IPv6 addressing. Network interfaces, multiple private IPv4 addresses, and IPv6 addresses are only available for instances running in a VPC. For more information, see Multiple IP Addresses. For more information about IPv6 in VPC, see IP Addressing in Your VPC in the Amazon VPC User Guide. If f1.16xlarge, g3.16xlarge, h1.16xlarge, i3.16xlarge, and r4.16xlarge instances use more than 31 IPv4 or IPv6 addresses per interface, they cannot access the instance metadata, VPC DNS, and Time Sync services from the 32nd IP address onwards. If access to these services is needed from all IP addresses on the interface, we recommend using a maximum of 31 IP addresses per interface. You can create a management network using network interfaces. In this scenario, the primary network interface (eth0) on the instance handles public traffic and the secondary network interface (eth1) handles backend management traffic and is connected to a separate subnet in your VPC that has more restrictive access controls. The public interface, which may or may not be behind a load balancer, has an associated security group that allows access to the server from the internet (for example, allow TCP port 80 and 443 from 0.0.0.0/0, or from the load balancer) while the private facing interface has an associated security group allowing RDP access only from an allowed range of IP addresses either within the VPC or from the internet, a private subnet within the VPC or a virtual private gateway. To ensure failover capabilities, consider using a secondary private IPv4 for incoming traffic on a network interface. In the event of an instance failure, you can move the interface and/or secondary private IPv4 address to a standby instance. Some network and security appliances, such as load balancers, network address translation (NAT) servers, and proxy servers prefer to be configured with multiple network interfaces. 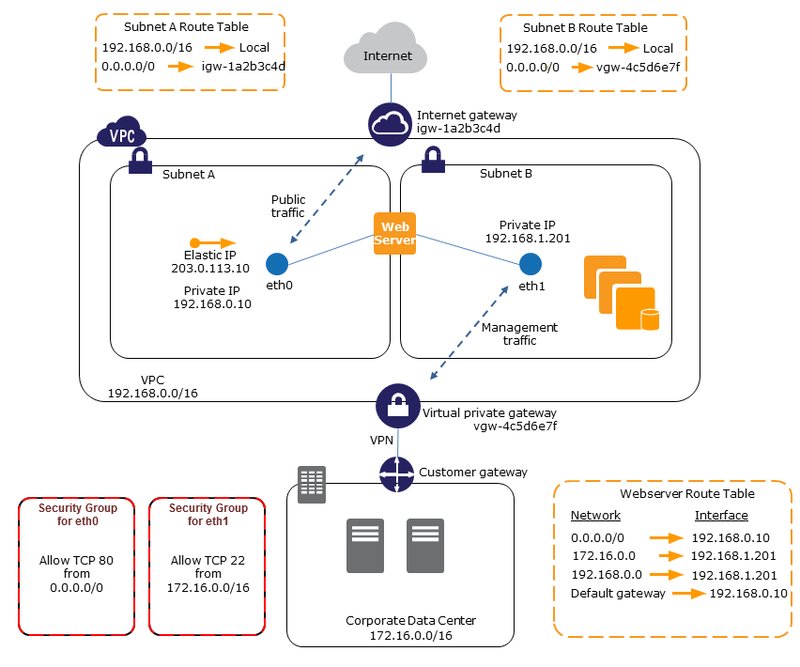 You can create and attach secondary network interfaces to instances in a VPC that are running these types of applications and configure the additional interfaces with their own public and private IP addresses, security groups, and source/destination checking. You can place a network interface on each of your web servers that connects to a mid-tier network where an application server resides. The application server can also be dual-homed to a backend network (subnet) where the database server resides. Instead of routing network packets through the dual-homed instances, each dual-homed instance receives and processes requests on the front end, initiates a connection to the backend, and then sends requests to the servers on the backend network. If one of your instances serving a particular function fails, its network interface can be attached to a replacement or hot standby instance pre-configured for the same role in order to rapidly recover the service. For example, you can use a network interface as your primary or secondary network interface to a critical service such as a database instance or a NAT instance. If the instance fails, you (or more likely, the code running on your behalf) can attach the network interface to a hot standby instance. Because the interface maintains its private IP addresses, Elastic IP addresses, and MAC address, network traffic begins flowing to the standby instance as soon as you attach the network interface to the replacement instance. Users experience a brief loss of connectivity between the time the instance fails and the time that the network interface is attached to the standby instance, but no changes to the VPC route table or your DNS server are required. You can attach a network interface to an instance when it's running (hot attach), when it's stopped (warm attach), or when the instance is being launched (cold attach). You can detach secondary (ethN) network interfaces when the instance is running or stopped. However, you can't detach the primary (eth0) interface. If you have multiple subnets in an Availability Zone for the same VPC, you can move a network interface from an instance in one of these subnets to an instance in another one of these subnets. When launching an instance from the CLI or API, you can specify the network interfaces to attach to the instance for both the primary (eth0) and additional network interfaces. Launching an Amazon Linux or Windows Server instance with multiple network interfaces automatically configures interfaces, private IPv4 addresses, and route tables on the operating system of the instance. A warm or hot attach of an additional network interface may require you to manually bring up the second interface, configure the private IPv4 address, and modify the route table accordingly. Instances running Amazon Linux or Windows Server automatically recognize the warm or hot attach and configure themselves. Attaching another network interface to an instance (for example, a NIC teaming configuration) cannot be used as a method to increase or double the network bandwidth to or from the dual-homed instance. If you attach two or more network interfaces from the same subnet to an instance, you may encounter networking issues such as asymmetric routing. If possible, use a secondary private IPv4 address on the primary network interface instead. For more information, see Assigning a Secondary Private IPv4 Address. If you need to use multiple network interfaces, you must configure the network interfaces to use static routing. For more information, see Configure a Secondary Elastic Network Interface. You can work with network interfaces using the Amazon EC2 console or the command line. You can create a network interface in a subnet. You can't move the network interface to another subnet after it's created, and you can only attach the network interface to instances in the same Availability Zone. For Description, enter a descriptive name. For Subnet, select the subnet. For Private IP (or IPv4 Private IP), enter the primary private IPv4 address. If you don't specify an IPv4 address, we select an available private IPv4 address from within the selected subnet. (IPv6 only) If you selected a subnet that has an associated IPv6 CIDR block, you can optionally specify an IPv6 address in the IPv6 IP field. For Security groups, select one or more security groups. To delete an instance, you must first detach the network interface. Deleting a network interface releases all attributes associated with the interface and releases any private IP addresses or Elastic IP addresses to be used by another instance. Select a network interface and choose Delete. In the Delete Network Interface dialog box, choose Yes, Delete. You can view all the network interfaces in your account. To view the details, choose Details. You can specify an existing network interface or attach an additional network interface when you launch an instance. If an error occurs when attaching a network interface to your instance, this causes the instance launch to fail. Select an AMI and instance type and choose Next: Configure Instance Details. On the Configure Instance Details page, select a VPC for Network, and a subnet for Subnet. In the Network Interfaces section, the console enables you to specify up to two network interfaces (new, existing, or a combination) when you launch an instance. You can also enter a primary IPv4 address and one or more secondary IPv4 addresses for any new interface. You can add additional network interfaces to the instance after you launch it. The total number of network interfaces that you can attach varies by instance type. For more information, see IP Addresses Per Network Interface Per Instance Type. If you specify more than one network interface, you cannot auto-assign a public IPv4 address to your instance. (IPv6 only) If you're launching an instance into a subnet that has an associated IPv6 CIDR block, you can specify IPv6 addresses for any network interfaces that you attach. Under IPv6 IPs, choose Add IP. To add a secondary IPv6 address, choose Add IP again. You can enter an IPv6 address from the range of the subnet, or leave the default Auto-assign value to let Amazon choose an IPv6 address from the subnet for you. On the Add Storage page, you can specify volumes to attach to the instance besides the volumes specified by the AMI (such as the root device volume), and then choose Next: Add Tags. On the Configure Security Group page, you can select a security group or create a new one. Choose Review and Launch. If you specified an existing network interface in step 5, the instance is associated with the security group for that network interface, regardless of any option that you select in this step. On the Review Instance Launch page, details about the primary and additional network interface are displayed. Review the settings, and then choose Launch to choose a key pair and launch your instance. If you're new to Amazon EC2 and haven't created any key pairs, the wizard prompts you to create one. You can attach a network interface to any of your stopped or running instances in your VPC, using either the Instances or Network Interfaces pages of the Amazon EC2 console. If the public IPv4 address on your instance is released, it does not receive a new one if there is more than one network interface attached to the instance. For more information about the behavior of public IPv4 addresses, see Public IPv4 Addresses and External DNS Hostnames. Choose Actions, Networking, Attach Network Interface. In the Attach Network Interface dialog box, select the network interface and choose Attach. Select the network interface and choose Attach. In the Attach Network Interface dialog box, select the instance and choose Attach. You can detach a secondary network interface at any time, using either the Instances or Network Interfaces page of the Amazon EC2 console. Choose Actions, Networking, Detach Network Interface. In the Detach Network Interface dialog box, select the network interface and choose Detach. Select the network interface and choose Detach. In the Detach Network Interface dialog box, choose Yes, Detach. If the network interface fails to detach from the instance, choose Force detachment, and then try again. You can change the security groups that are associated with a network interface. When you create the security group, be sure to specify the same VPC as the subnet for the network interface. To change security group membership for interfaces owned by other services, such as Elastic Load Balancing, use the console or command line interface for that service. Select the network interface and choose Actions, Change Security Groups. In the Change Security Groups dialog box, select the security groups to use, and choose Save. The Source/Destination Check attribute controls whether source/destination checking is enabled on the instance. Disabling this attribute enables an instance to handle network traffic that isn't specifically destined for the instance. For example, instances running services such as network address translation, routing, or a firewall should set this value to disabled. The default value is enabled. Select the network interface and choose Actions, Change Source/Dest Check. In the dialog box, choose Enabled (if enabling) or Disabled (if disabling), and Save. If you have an Elastic IP address (IPv4), you can associate it with one of the private IPv4 addresses for the network interface. You can associate one Elastic IP address with each private IPv4 address. You can associate an Elastic IP address using the Amazon EC2 console or the command line. Select the network interface and choose Actions, Associate Address. In the Associate Elastic IP Address dialog box, select the Elastic IP address from the Address list. For Associate to private IP address, select the private IPv4 address to associate with the Elastic IP address. Choose Allow reassociation to allow the Elastic IP address to be associated with the specified network interface if it's currently associated with another instance or network interface, and then choose Associate Address. If the network interface has an Elastic IP address (IPv4) associated with it, you can disassociate the address, and then either associate it with another network interface or release it back to the address pool. This is the only way to associate an Elastic IP address with an instance in a different subnet or VPC using a network interface, as network interfaces are specific to a particular subnet. You can disassociate an Elastic IP address using the Amazon EC2 console or the command line. Select the network interface and choose Actions, Disassociate Address. In the Disassociate IP Address dialog box, choose Yes, Disassociate. You can assign one or more IPv6 addresses to a network interface. The network interface must be in a subnet that has an associated IPv6 CIDR block. To assign a specific IPv6 address to the network interface, ensure that the IPv6 address is not already assigned to another network interface. In the navigation pane, choose Network Interfaces and select the network interface. Under IPv6 Addresses, choose Assign new IP. Specify an IPv6 address from the range of the subnet. To let AWS choose an address for you, leave the Auto-assign value. You can unassign an IPv6 address from a network interface using the Amazon EC2 console. Under IPv6 Addresses, choose Unassign for the IPv6 address to remove. You can set the termination behavior for a network interface that's attached to an instance. You can specify whether the network interface should be automatically deleted when you terminate the instance to which it's attached. You can change the terminating behavior for a network interface using the Amazon EC2 console or the command line. Select the network interface and choose Actions, Change Termination Behavior. In the Change Termination Behavior dialog box, select the Delete on termination check box if you want the network interface to be deleted when you terminate an instance. You can change the description for a network interface using the Amazon EC2 console or the command line. Select the network interface and choose Actions, Change Description. In the Change Description dialog box, enter a description for the network interface, and then choose Save. Tags are metadata that you can add to a network interface. Tags are private and are only visible to your account. Each tag consists of a key and an optional value. For more information about tags, see Tagging Your Amazon EC2 Resources. In the details pane, choose Tags, Add/Edit Tags. In the Add/Edit Tags dialog box, choose Create Tag for each tag to create, and enter a key and optional value. When you're done, choose Save.